Despite its threatening fairytale name, the Australian bearded dragon is not one to breathe fire or snort smoke. However, he can kill small prey with a mild venom, according to research published in the science journal "Nature." Fortunately, his venom is harmless to humans, and the docile nature of the bearded dragon makes him one of the most popular reptile pets for children. For years, animal experts and pet owners alike considered bearded dragons non-venomous. In 2005, Australian scientists discovered that when a bearded dragons bites his prey, he actually secretes a mild venom that is similar to rattlesnake venom. 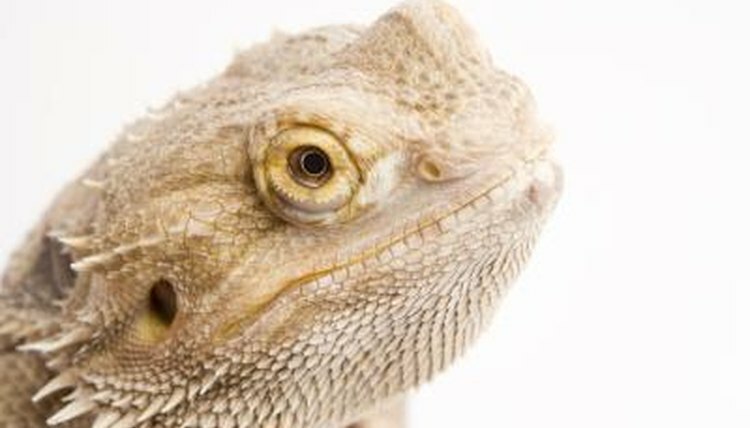 A bearded dragon bite causes swift swelling and profuse bleeding in humans, but no long lasting or serious side effects. Scientists once thought that when a bearded dragon bit a human, bacteria from the lizard's mouth caused an infection and a nasty looking injury. Now they believe that about 100 lizards, including the bearded and Komodo dragons, the Gila monster, Mexican beaded lizard and monitor lizard all produce some type of venom that causes the swelling after a bite. Research indicates that all poisonous lizards and snakes share the same ancestor, a creature from dinosaur times. Bearded lizard venom promises a treasure trove of potential in the medical world. Venom from lizards such as the Gila monster and Mexican beaded lizard already is used in a drug to control diabetes, according to a 2010 study in the science journal "Molecular & Cellular Proteomics." The study identified three new compound amino acids found in lizard toxins that may be used to treat heart disease. Poisonous lizard species need protection to help prevent the loss of other important "genetic information," the study said. Most bearded dragon pets quickly adapt to handling. Usually children can hold them without fear of being bitten. However, a beardie is not a cuddly pet. When startled or handled roughly, a bearded dragon may bite, causing a painful injury. The lizard's venom is not toxic to humans, but wash the wound thoroughly to help prevent infection. Beware of the dragon's skin as well. The skin of a bearded dragon can be rough enough to scratch your skin. Wearing a long-sleeved shirt and gloves will reduce the risk of irritation or injury. If you don't want his sharp nails to cut you, trim them every few weeks. You don't need to worry about the poison from a bearded dragon's venom or being singed by fiery dragon breath. However, there is another threat: salmonella bacteria. Bearded dragons, like other reptiles, often carry salmonella bacteria, and can pass it on to humans. Salmonella can cause serious intestinal illness, so scrub your hands with hot water and antibacterial soap before and after you handle a bearded dragon.